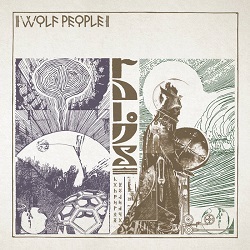 Wolf People hold a special place in the spectrum of what we called for a while “psychfolk”. Their albums, and Ruins is no different in this, have a strong folk edge – Jack Sharp’s vocals have a clear English voice that sounds like it’s destined for some future incarnation of Fairport Convention. Songs appear with Argus-era Wishbone Ash melodies. There’s some flute in the mix. And then the edgy-pastoral Wickermanesque songs which might be about treasure hunting using a Hand Of Glory take a mighty side swerve into a harder Witchfinder General territory as crunching guitars, pounding drums and deep booming bass reveal Wolf People as a band enamoured of that late sixties heavy rock sound. If looking for a more modern comparison, try Espers crossed with Hazards of Love era Decemberists. It’s a sound that can’t be ignored, and that yet remains hooked into a very folky feel even as fuzzed electric guitar lets rip and steers a song towards Space Rock heights. Lyrics are often dark and brooding – Night Witch is a perfect example of this “I’d fly every night if I could / On wings of paper and wood / Delivering death wherever I go / As graceful and quiet as snow / as snow so heavy ceaselessly falls / I will bury you all / I am Night Witch”. It’s like Sandy Denny’s John the Gun crossed with Black Sabbath. Another standout track is Kingfisher which is a beautifully intense love song, played out at full volume. Ruins is certainly no disappointment after Wolf People’s previous albums – it’s at the same moment quite magically delicate and as hard as a brick. Wolf People are savagely loud in a live setting – and they have some UK dates coming up on their European tour this April. A journey into a dark wasteland of magical creatures and hazardous encounters. And it rocks, it rocks so hard.